As the nimbler counterpart to the 14″ Matebook X and the Matebook X Pro, the Matebook 13 compresses the performance of its larger siblings into Huawei’s most portable offering yet. 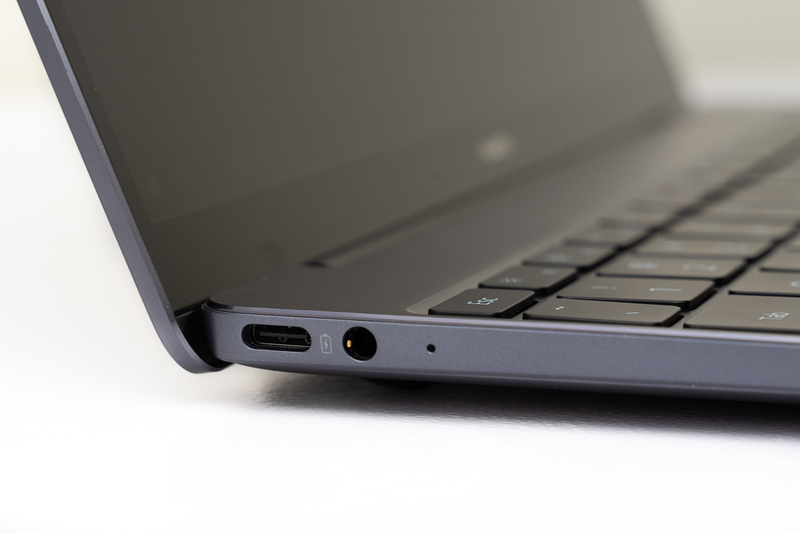 Carrying the same hardware as 14″ models and weighing just 2.9lbs, the Matebook 13 sacrifices front facing-speakers to achieve this respectable portability. Though its trackpad is underwhelming, its greatest weaknesses are its dim display and below-average battery life. Nonetheless, starting at CAD$1,370, it earns my recommendation for users who frequently leave the office for a few hours at a time. Huawei’s first premium notebooks, the Matebook X series, took the world by storm. It attracted users from all sectors with its excellent performance, gorgeous looks, and great value. 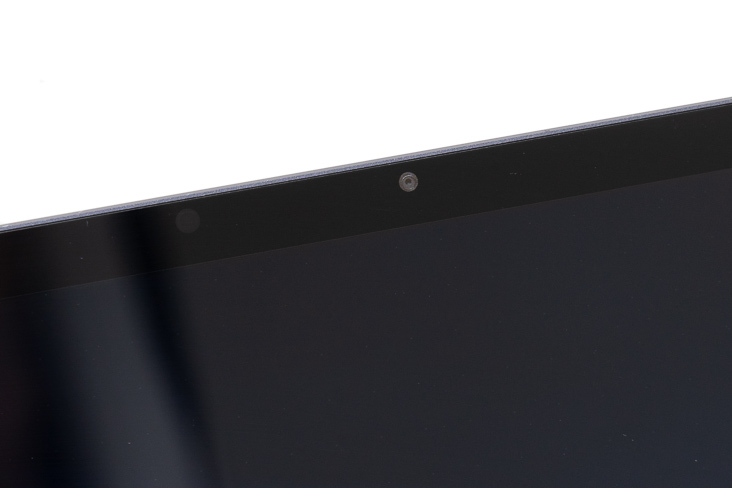 It was also the first laptop to trim the top bezel by embedding the webcam in the keyboard – although its success is debatable. 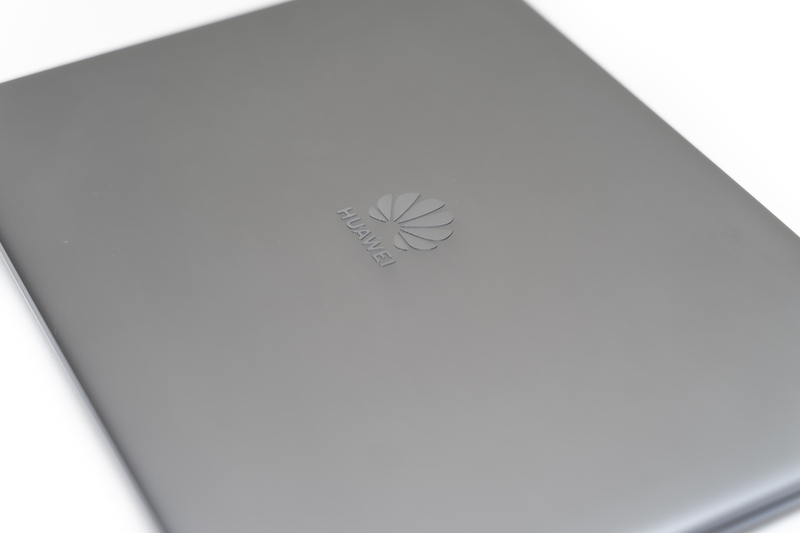 In January 2019, Huawei released the Matebook 13 to bring the performance of the 14″ Matebooks into a smaller form factor. 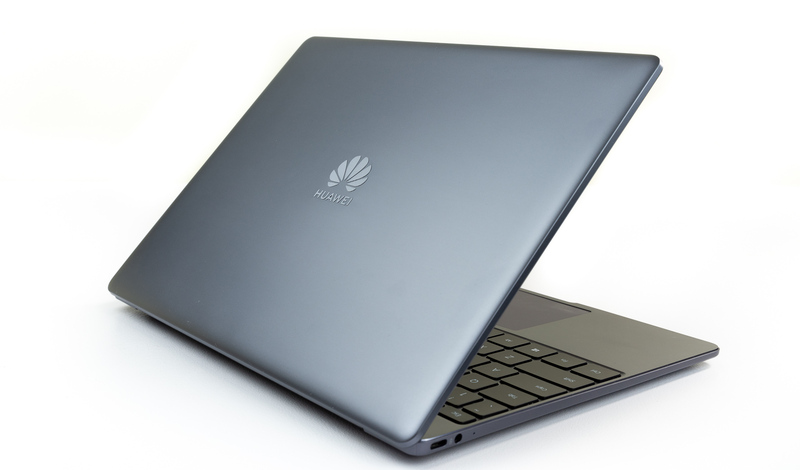 Carrying a 13″ display and a smaller body, the Matebook 13 is the most portable option in Huawei’s laptop portfolio. Despite a smaller body, it still sports an Intel 8th Gen quad-core processor, and can even be configured with dedicated Nvidia GeForce MX150 graphics. Huawei is also adamant in keeping the dual fan cooler and has improved the fan blades to deliver more air. Is it blue or is it grey? That’s a matter of perspective. Tilt the surface at an angle, and the Matebook 13 shifts from navy blue to light grey, lending the product the illusion of a two-toned finish in my pictures. The coating resists fingerprints incredibly well, meaning less time spent wiping and more time working. Sporting a full-metal body with sharp edges and smooth corners, the Matebook 13 is crafted with care and precision, and should withstand everyday handling with ease. Despite its premium materials, it still manages to keep the weight at 1.30 kg (2.87lbs) – only 50g heavier than the Macbook Air. The model without the Nvidia GeForce MX150 is slightly lighter at 1.27kg, or 2.82lbs. The slightly recessed power button has a fingerprint reader embedded within it. This is the Matebook’s only method of biometrics sign-in as the webcam doesn’t support Windows Hello facial recognition. 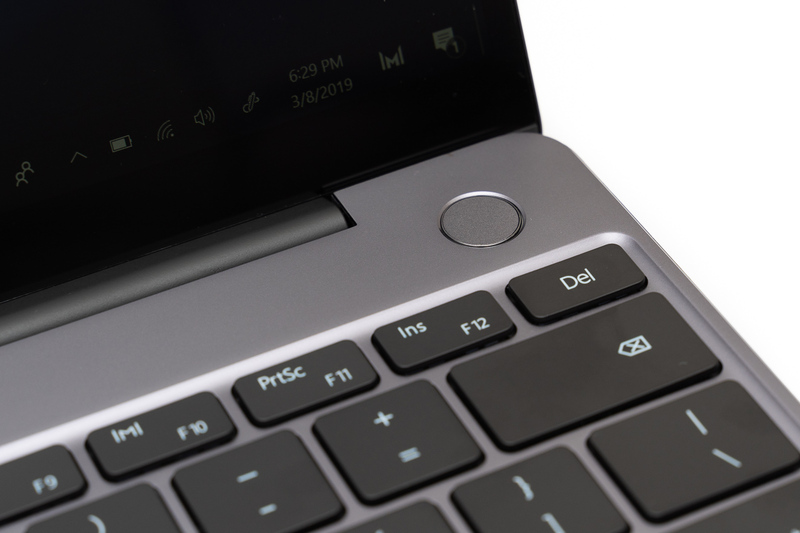 Speaking of the webcam, the Matebook 13 now has it placed in an ultra-narrow bezel along the top, abandoning the keyboard pop-up camera design. Although the pop-up camera offers better privacy, many users didn’t enjoy a video feed of their nostrils. A smaller display shrinks the chassis and increases portability. An unfortunate casualty of this design is the front-facing speakers, which now fire from the base. Their audio competency extends only as far as being able to produce sounds, and is subpar even compared to budget stereo systems. The shallow bass punches like a feather, tickling the tiny mids and weak treble. Two fans draw air from the rear mesh and expel it through the vents between the display and the base. Both fans are situated at the center, so make sure to leave a gap for them when the laptop is resting on the lap. When the fans are blocked, the Matebook 13 heats up noticeably faster. The glossy logo has been replaced by a raised, textured print. Because it no longer reflects light, it’s far more inconspicuous. 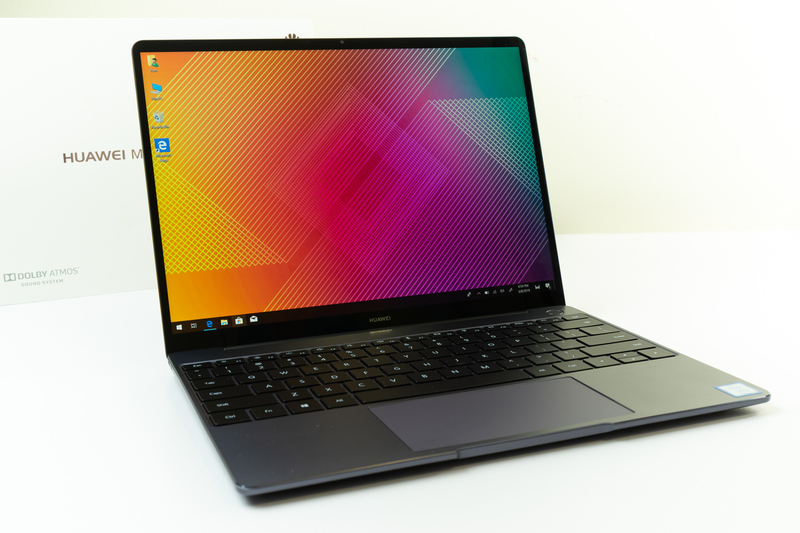 In an effort to reduce the price while maintaining equal quality to the Matebook X Pro, the Huawei Matebook 13 uses a lesser 13” 2640 x 1440p IPS display, amounting to a 3:2 aspect ratio and 200ppi. It’s still suitable for web photo editing with a 99 per cent Adobe sRGB color gamut coverage, but its 300nit maximum brightness is a step lower than the Huawei Matebook X Pro. 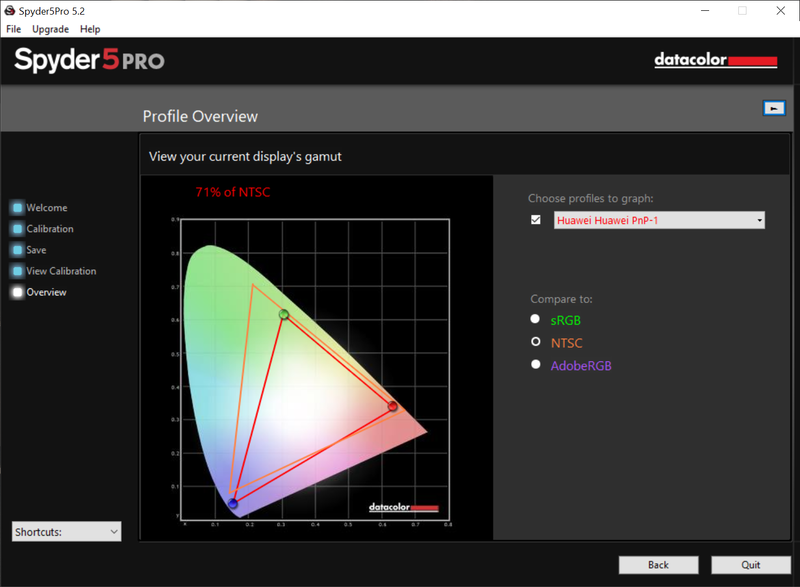 Its contrast ratio is also lower, peaking at 1,000:1 as opposed to the Matebook X Pro’s 1,500:1. While color gamut is good, the Matebook 13 has very pronounced light bleed. At peak brightness against a black background, there’s a noticeable light band circling the display’s edges and glaring light domes radiating from the corners. Another issue is brightness. Even when dialed to the highest setting, it can feel a bit dim even against the warm lights in Starbucks. The Matebook 13 uses either the Intel Core i5-8265U or the Intel Core i7-8565U, both of which are 15W TDP quad-core processors released last year under the “Whiskey Lake” family, which are the refreshes of the “Kaby Lake R(efresh)” family from 2017. Besides moving to a more efficient 14nm++ transistor node – which enables a 600MHz higher clock frequency – their architecture remains the same. 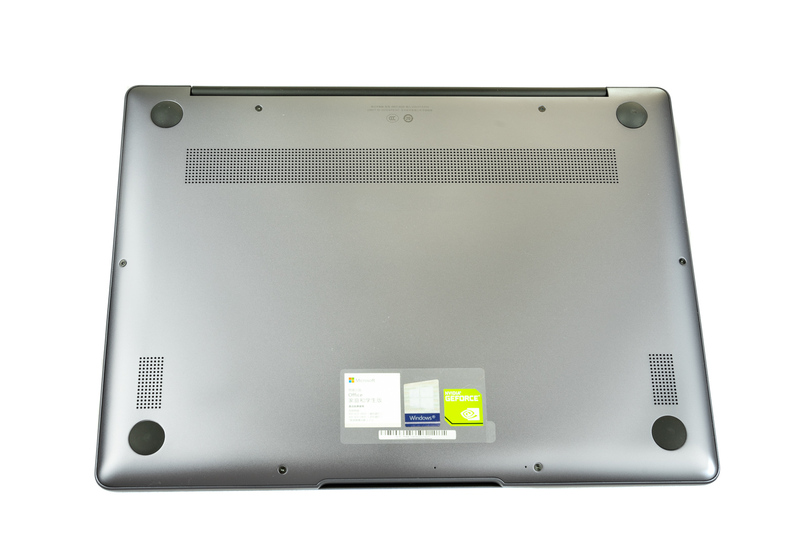 Our model is equipped with the Core i7-8565U. Contrary to my expectations, the increased frequency brings a tangible boost in benchmark scores. 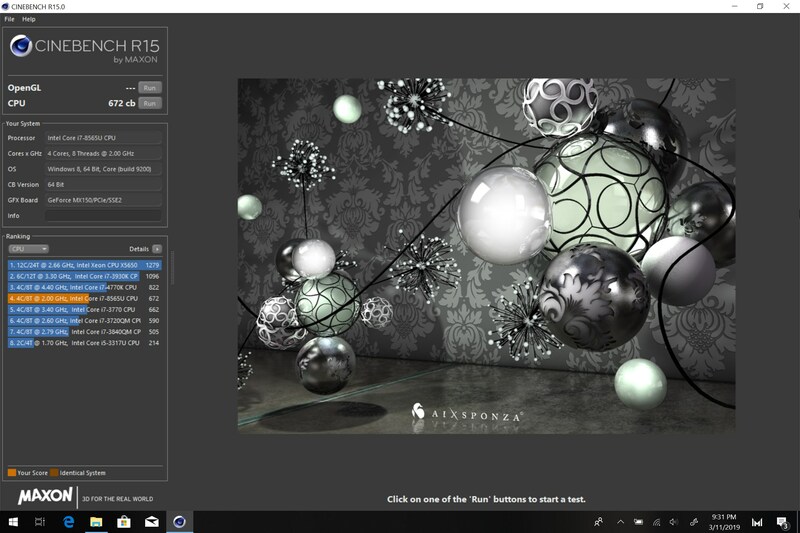 In Cinebench R15, the Matebook 13 produced an average score of 657.5 across four runs, 56 points higher than the ASUS Zenbook UX 391 with Intel Core i7-8550U. 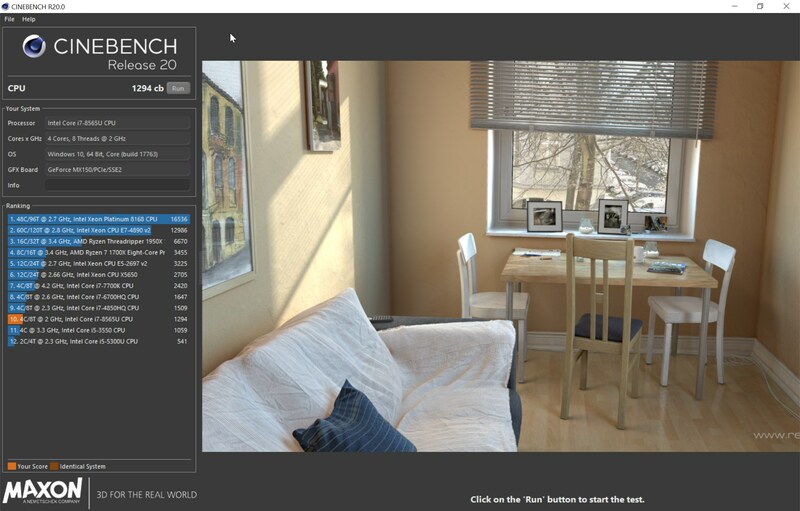 Recently, Maxon released Cinebench R20, so we decided to include it in our review too. Ultra-thin laptops, especially one as compact as the Matebook 13, don’t typically come with dedicated graphics, which is why I’m impressed to see the Nvidia GeForce MX150 dedicated graphics processor. Although it’s an entry-level solution, the MX150 is still faster than the integrated Intel UHD 620 graphics. In addition, it carries 2GB of dedicated GDDR5 VRAM. The Nvidia GeForce MX150’s principal issue is its power draw. With a 25W TDP, it’s far higher than the Intel integrated graphics. An anemic battery further compounds the concern. Huawei selected the Western Digital Black SN750 SSD as the storage choice. It features Western Digital’s 64-layer TLC NAND and its in-house controller. The i5 model comes with 256GB, while the i7 model comes with 512GB. The choice was excellent. 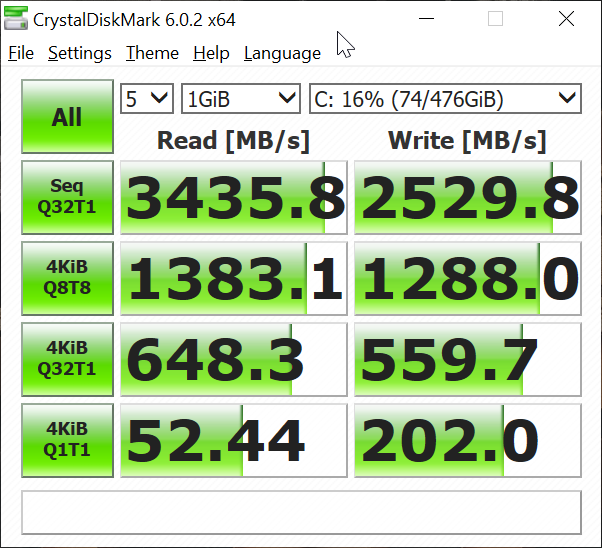 The WD Black SN750 is blazing fast, maxing out at 3.5GB/s in sequential read and 3GB/s in sequential write. Random read and write is equally impressive, topping out at 52MB/s and 202MB/s respectively. 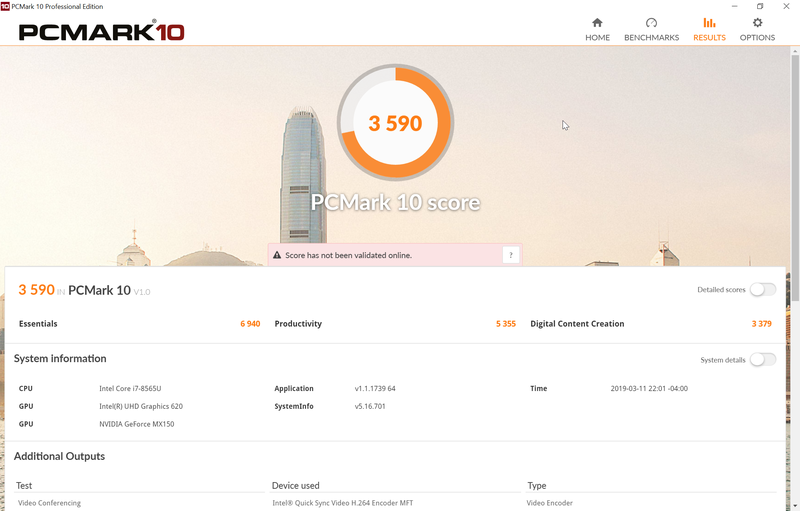 PCMark10’s productivity suite does an excellent job at evaluating overall system performance. 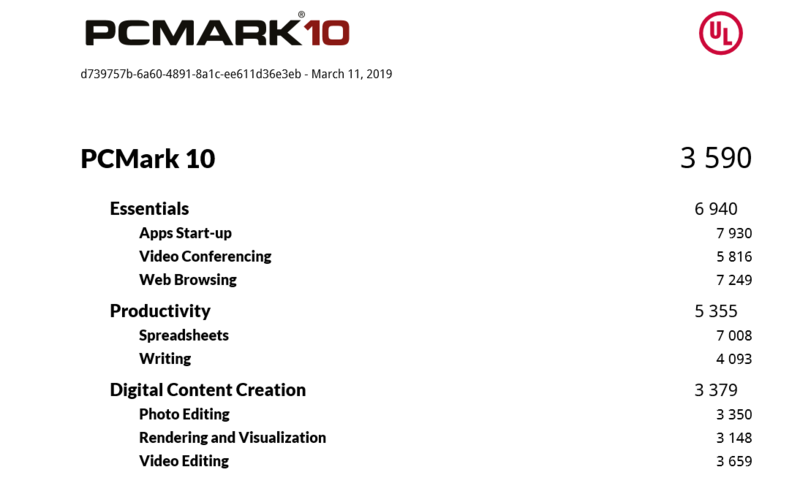 Its test suite includes a blend of professional workloads including writing, conferencing, and video editing, which stresses individual components as well as how well they work in synergy. Interestingly, the Matebook 13 scored lower than the ASUS Zenbook UX391 in the Productivity section despite having stronger hardware in almost all regards. The 169 point difference dragged down the Matebook’s final average score. The Matebook 13 uses two thermal modules to manage heat. A heat pipe extends from the left and right heatsinks that covers the CPU and GPU respectively and into their dedicated fans in the center. Huawei updated the fan design to something called Shark Fin 2.0, which now delivers 25 per cent more airflow at the same rotation speed compared to Shark Fin 1.0. 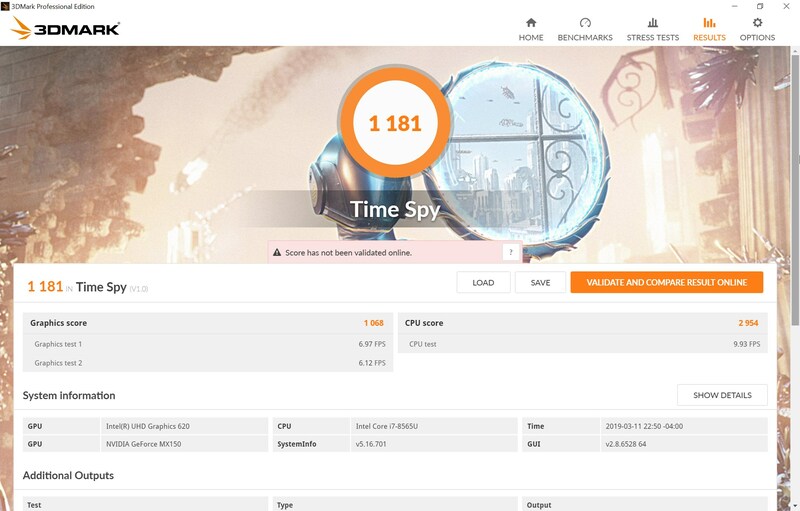 AIDA64’s CPU stress test provided a good overview of how the laptop throttles. The Intel Core i7-8565U processor could maintain the advertised 4.0Ghz frequency on all cores for about four minutes, during which the temperature rises to 90C. After four minutes, all cores ramps back down to 2.3GHz, with the temperature kept at 80C and the fan speed lowered. At idle, the CPU cores ramped down to around 800MHz and temperature held steadfast at 41C. The fans were virtually silent. Under load, the top right quadrant was the hottest area, registering 44C on my infrared thermometer. The palm rest area and a majority of the keyboard never rose above 37C – still a bit warm, but not too bothersome. The Matebook 13 sacrifices the front-facing speakers, yet leaves enough room for a full-sized backlit keyboard – the arguably more important feature for professionals. The island keys are adequately spaced, which provides enough distinction when moving between one key to the next. The membrane switches feel slightly more tactile than the Matebook X Pro but are equally silent. I’m impressed by the keyboards overall quality and have no qualms typing on it all day long. The trackpad, on the other hand, is underwhelming. My review unit had a subtle yet annoying wobble, something that didn’t exist on the 14” Matebook X Pro. This could simply be a unit-specific issue, though I wonder how many more units like this passed QA. Compared to the trackpads on the Apple Macbooks and the Microsoft Surface laptop, the Matebook 13’s is distinctly subpar. Huawei clearly cut some corners here by abandoning glass and using plastic instead. The material downgrade makes scrolling scratchy and rough. Tracking accuracy is good, although it did accidentally register several unintended clicks. In the ultrabook domain, The Matebook’s 41.8Wh battery errs on the low-end. Though the capacity is common for devices in its class, the dedicated graphics processor requires more juice to achieve all-day battery life. Also, many other competitors feature much higher capacities. For example, the Dell XPS 13 has a 52Wh battery while the HP Spectre 13 has 61Wh. 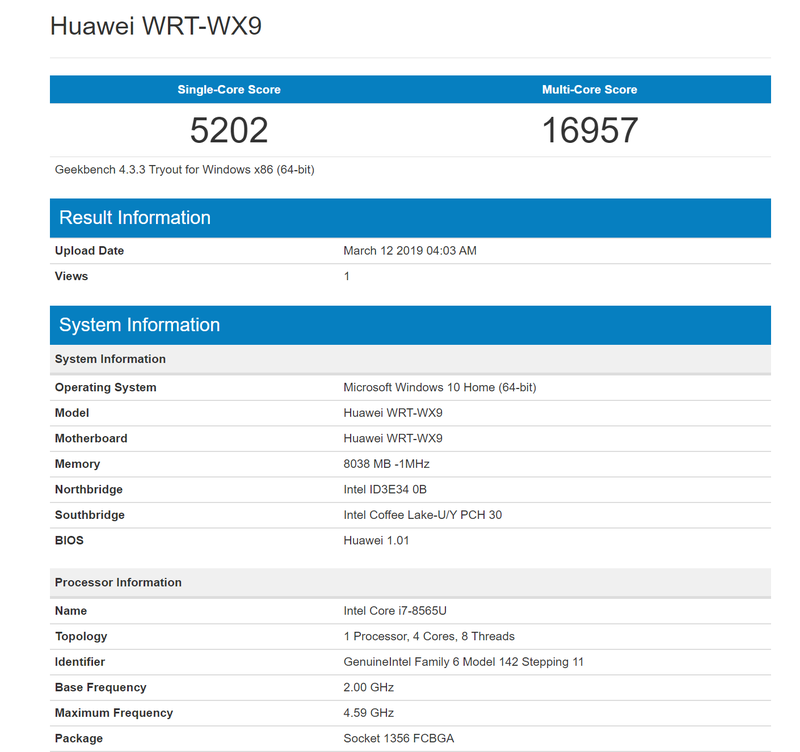 Since the Nvidia GeForce MX150 dedicated graphics and its cooling solution both take up a chunk of space, it’s no surprise that Huawei trimmed the battery size. And that capacity constraint manifested in general productivity. It struggles to get through an entire workday of emails, writing, web browsing, and videos. More often than not, I reach for the charger after about 6 hours of use. As expected, heavier programs like Adobe Lightroom further reduces that benchmark. Luckily, the Matebook 13 does charge very rapidly. A 15-minute charge can deliver enough juice for around 2 hours of light productivity. 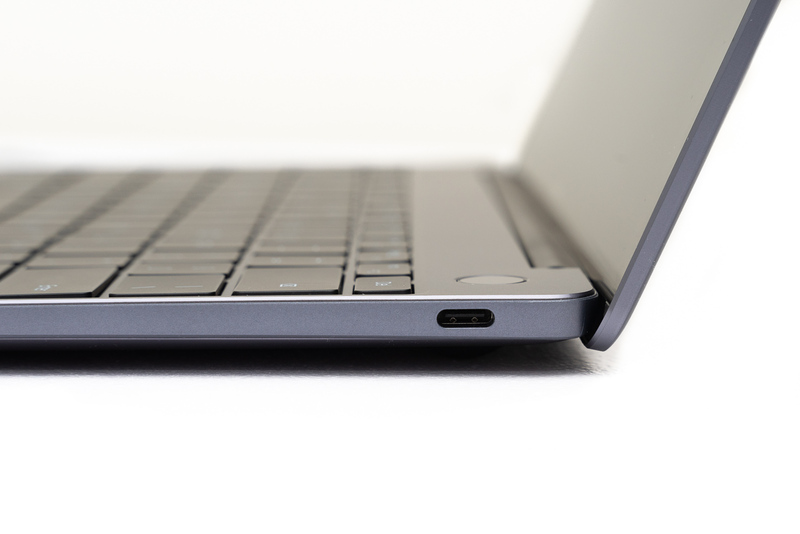 A grand total of three ports are installed on the Matebook 13: two USB-C ports and a headphone jack. The left USB port supports data and charging while the right supports data and DisplayPort. Huawei alleviates the anemic port selection with an expansion dock, but only in select models. Despite its low pixel count, the 1MP webcam actually does a respectable job at capturing the scene. While the dynamic range is poor, its decent white balancing and relatively clear detail should be adequate for web conferencing. Starting at $1,370, the entry point Matebook 13 includes an Intel Core i5-8520U quad-core CPU, 8GB RAM, 256GB storage, and integrated Intel UHD 620 graphics. Bumping that up to an Intel Core i7-8565U processor and a 512GB SSD increases the cost to $1,749.99. Maxing out the specs with the dedicated Nvidia GeForce MX150 graphics pushes the price to $1,928.99. There’s no question that the Matebook 13 is aimed at usurping Apple’s 2018 MacBook Air, and in 2019, the MacBook Air just doesn’t feel all that competitive anymore. Whereas the MacBook Air sports a better display, the Matebook has superior processor performance and higher starting storage capacity – all at a $120 lower entry price. And although the MacBook Air’s touchpad is leagues above the Matebook’s, it’s keyboard’s shallow travel pales to the Huawei’s. With that said, the MacBook Air does have a distinct edge in battery life. The real competition, then, comes from manufacturers like Dell, HP, and Lenovo. The Dell XPS 13, HP Spectre series, and Lenovo’s ThinkPads all carry similar hardware to the Matebook 13 and have larger batteries to boot. The Lenovo ThinkPad, particularly the ThinkPad Carbon, is also renowned for its incredible durability. With that said, I haven’t had much time with any of these machines, so it’s tough to give one proper recommendation over another. Focusing on performance first, Huawei made little compromises to the Matebook 13’s internals. 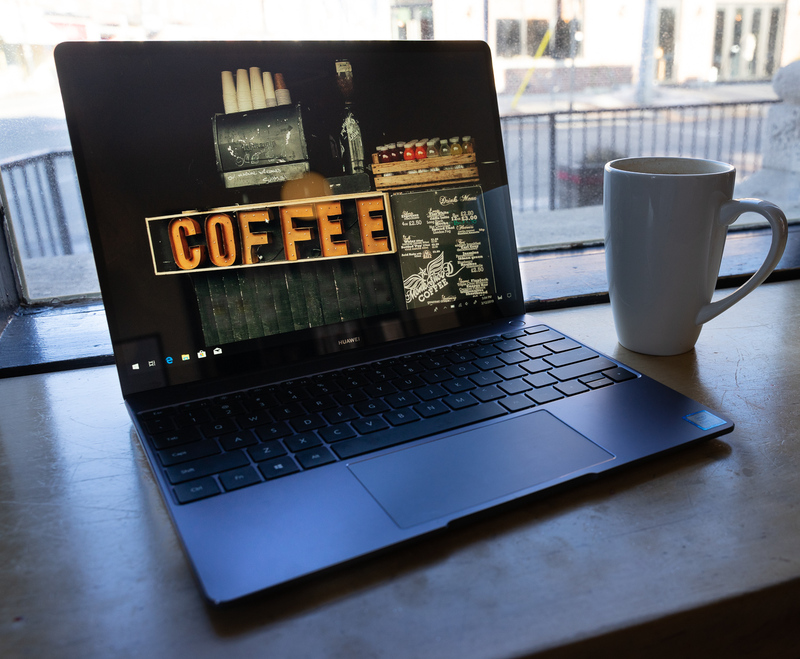 The 8th-gen Intel quad-core processors, 8GB of RAM, and a dedicated graphics option handily cut through everyday productivity tasks and even light professional work. Its screen, while just averagely bright, is still plenty sharp, though I wished it could be a tad brighter. 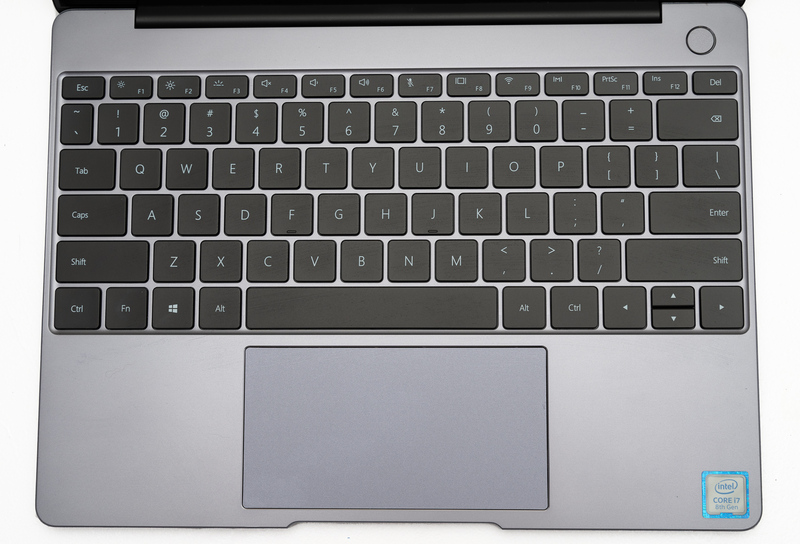 Unfortunately, its compromises in other areas become noticeable after prolonged use: a plastic trackpad just isn’t as smooth nor as premium as the one on the Matebook X Pro; the 41.8Wh battery feels constrained, too, especially considering that the dedicated graphics need extra power when ramped up; and although its display deserves praise for its colors, brightness is lacking and light bleed is rampant. Making these slight quality of life downgrades enables Huawei to clamp down the Matebook 13’s pricing. Starting at $1,370, the comparatively cheaper pricing lands the Matebook 13 as an excellent choice for users seeking an ultra-portable device with powerful components. If you do pick one up, make sure to keep its charger with you at all times.